The crowd hasn't given up just yet at Clinton HQ. They are chanting "I believe that she will win." John Podesta, Clinton's campaign chair, is speaking at their HQ at the Javits Center. 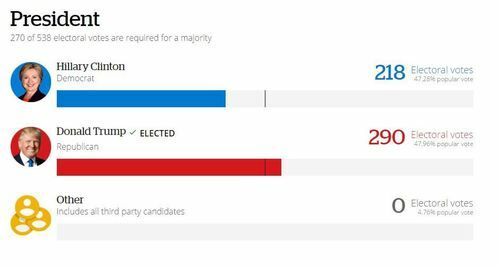 "Every vote should count. Several states are still close to call so we're not going to have anything more to say tonight." 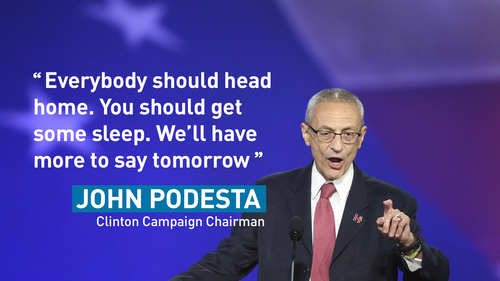 Podesta is telling people to head home and get some sleep and that they will have more to say tomorrow. Supporters can be seen putting their coats on and getting ready to leave the hall. "She has done an amazing job and she is not done yet ... let's bring this home." Clinton's campaign chair John Podesta talks to supporters at Clinton HQ in New York. His address was brief but he remained optimistic. If you missed them, here are John Podesta's full remarks to supporters at Clinton HQ just moments ago. Donald Trump is expected to arrive at campaign HQ shortly and speak to supporters. We'll be carrying it live in the stream above. A look at the crowd of Trump supporters at his New York HQ. Note the sea of red "Make America Great Again" hats. 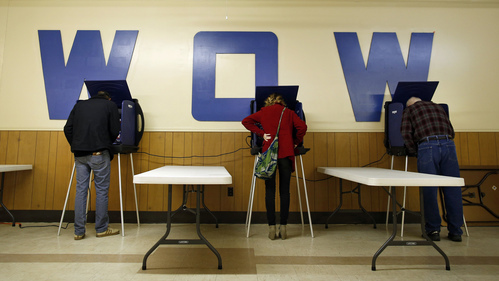 The Michigan vote remains undecided after 2 a.m ET Wednesday. 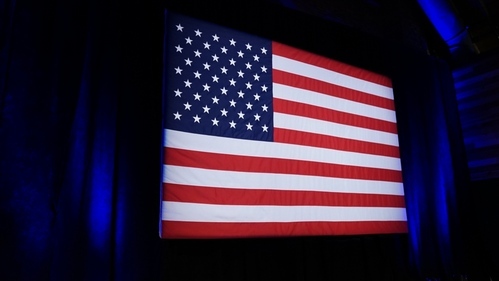 At the Democratic headquarters in Detroit, a victory party never quite got off the ground, with many leaving early, expressing disappointment at a potential Donald Trump victory. 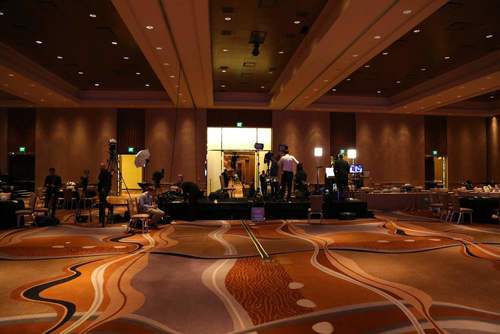 At 2 a.m., security turned on the lights and asked the few supporters left in the room and the reporters to go home, leaving an empty hall with half-inflated balloons and spilled beer bottles. As we wait for Trump to speak, another run down through the states we are still waiting to call. 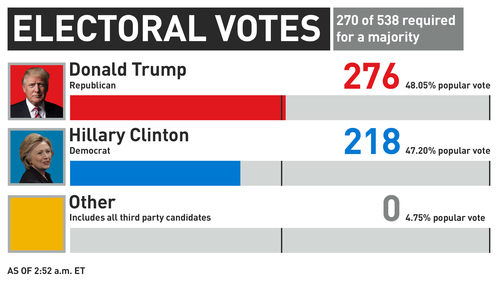 The Associated Press declares Trump will win the presidency, while others are still waiting with some races still too close to call. Mike Pence and his wife have taken the stage at Trump HQ in New York. Pence is now speaking and presumably introducing Trump. "This is a historic night. The American people have spoken and the American people have elected their new champion." 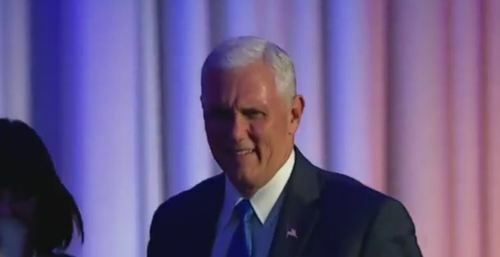 Pence is thanking god and his family, who surround him at the podium. "I'm deeply grateful to the American people for placing their confidence in this team." Trump has begun speaking at campaign HQ in New York. "Sorry to keep you waiting ... complicated business." He said he has received a call from Clinton and said she had congratulated him on the "victory." "We owe her a major debt of gratitude for her service." 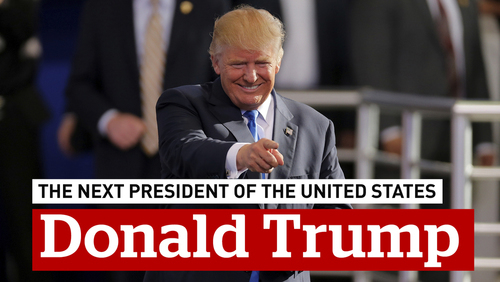 CBC News is projecting that Donald Trump will become the president of the United States. Trump said America will be rebuilding infrastructure and remembering the forgotten by taking care of the veterans. Trump said America will double their growth and have the strongest economy anywhere in the world. He said they will be a friend to any nation that will be friends with them. "No dream is too big. No challenge is too great." Trump is running through and thanking members of his family. Trump is now running through and thanking members of his campaign team, including Rudy Giuliani and Chris Christie. Trump continues to speak at his HQ in New York. "To be really historic, we have to do a great job. And I promise you, I will not let you down." "We're going to get to work immediately for the American people." Trump ends his speech by saying that he loves America. And that's it. 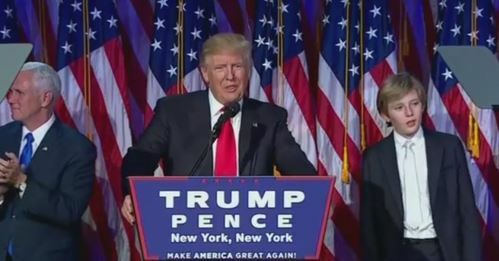 President elect Donald Trump finishes his speech. He leaves the stage to the tune of "You Can't Always Get What You Want" by the Rolling Stones. That tune has ended nearly every rally of his during the campaign. Here he is, shaking hands and kissing members of his family. With Trump tonight's winner, congratulations is starting to come in from some of the Republican opponents he faced during the primary race. 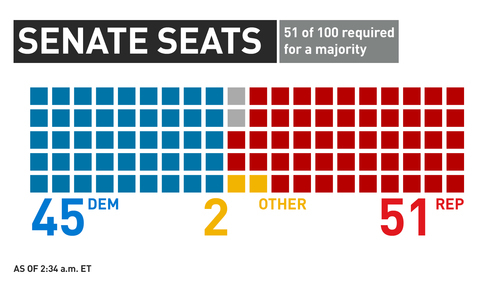 And here is where we lie results wise. We are still waiting for results from New Hampshire, Michigan and Minnesota. 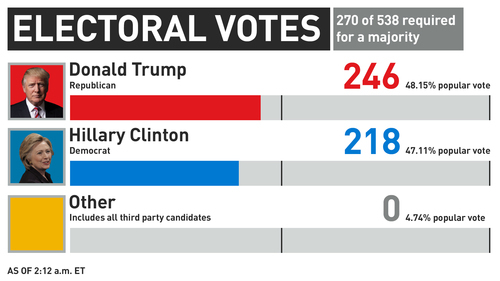 Trump leads in Michigan while Clinton leads in Minnesota and New Hampshire. The latest on Trump's win. 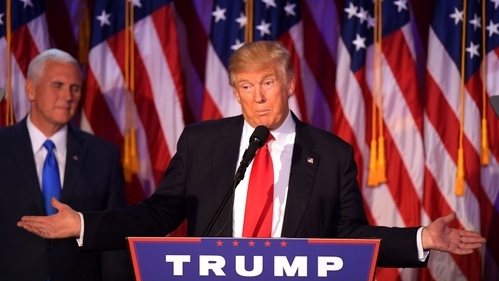 CBC NewsDonald Trump has been elected the next president of the United States — a remarkable showing by the celebrity businessman and political novice who upended American politics with his bombastic rhetoric. 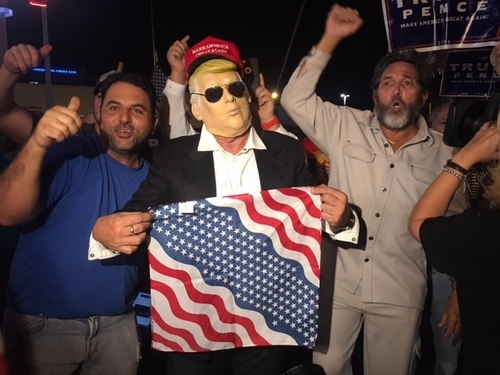 The CBC's Susan Ormiston said there is a celebratory mood in Miami, with supporters dancing in the streets after an upset victory. "We got this, the deplorables got this." 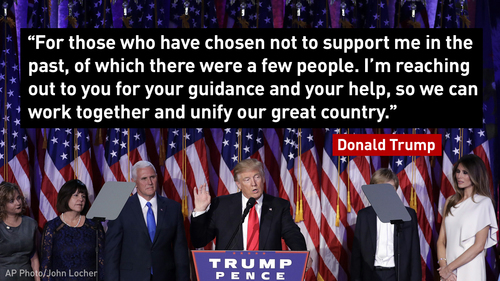 A memorable moment from Trump's speech tonight (this morning? ), thanking Clinton for her service. Trump said he spoke to Clinton on the phone and she congratulated him on his win. The CBC's Adrienne Arsenault remains out front of the White House in Washington, where Americans are reacting to the news of Trump's victory. Her description of the mood? "Street outside White House is like a wake and a happy cocktail party booked the same room and are mingling awkwardly." Oh, and there has been a Trump hat burning. Thoughts on Clinton's loss, from CBC's new opinions producer, Robyn Urback. 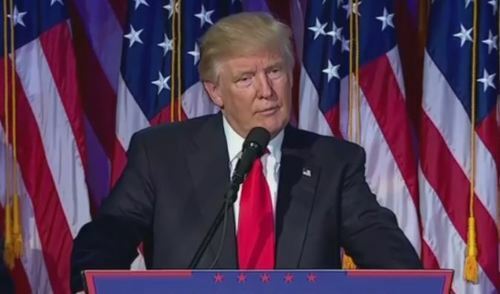 CBC NewsNothing was left so utterly decimated in the aftermath of Donald Trump’s staggering victory as the integrity of the Democratic Party, which somehow managed to concede the election to a man who made his political debut by accusing the president of being a Kenyan imposter. Clinton didn't speak or appear at her New York City HQ on Election Night (she left that to her campaign chair John Podesta) but a campaign aide said she will be speaking on Wednesday morning. Here's what the election looked like for the CBC's team in North Dakota. CBC NewsDemocrats sat stunned, staring at their smartphones. 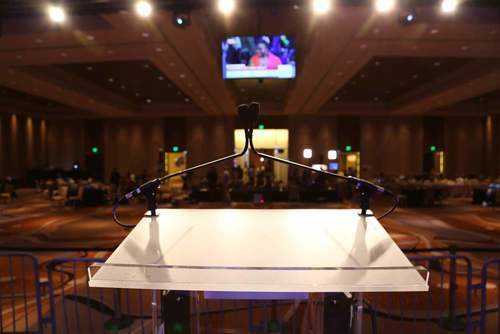 Republicans issued muted, almost disbelieving cheers every time they claimed another state. 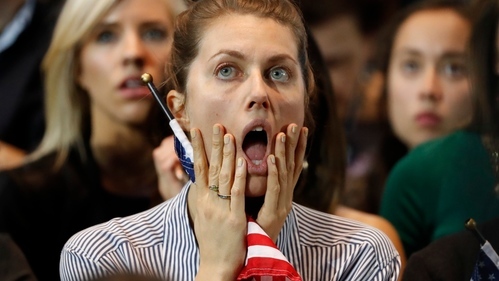 That's how a shocking U.S. election night unfolded in Fargo, N.D., where Democrats and Republicans held a pair of "victory parties" about five blocks and an emotional universe away from each other.